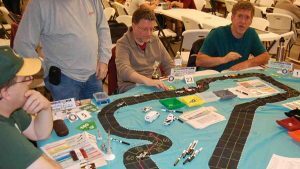 The CFR-Detroit 2018 racing season began on Friday, May 11, 2018, at the Guild of Blades game store in Clawson, Michigan. 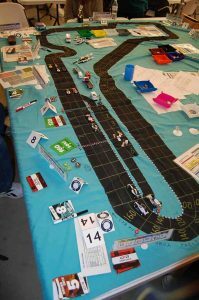 Eleven drivers participated, and when the race was over, Garry Kaluzny emerged victorious after overtaking Jim Robinson in the final corner of the race. Jim Robinson did finish 2nd, and the final podium position, 3rd place, went to Mike Cook. Last season’s champ, Gary Sturgeon, finished in 5th place after starting from pole position. There had been some talk before the race of using the optional “knock-out” qualifying bidding (as detailed on page 16 of the Championship Formula Racing rulebook), but in the end it was decided to go with the normal Pole Bid rules (as detailed on page 11 of the CFR rulebook). The drivers who participated all arrived at Guild of Blades in plenty of time to set up their car’s specifications before bidding for qualifying began promptly at 6:45 pm. 2017’s CFR-Detroit champion, Gary Sturgeon, took the pole position with a bid of 4.0 (1 wear + 6 skill). (Reminder: Each wear is worth 1.0 point in bidding, while each skill is worth 0.5 point in bidding.) Starting in 2nd was Jim Robinson, also with a bid of 4.0 (2 wear + 4 skill). Sturgeon rolled better on a percentage dice roll, 52 to 43, and thus managed to start on the pole. Third and 4th places also came down to a percentage dice roll as both Mike Cook (2 wear + 3 skill) and Richard White (3 wear + 1 skill) each bid 3.5. Cook rolled 51, and White rolled 16, thus Cook started 3rd and White began in 4th. Garry Kaluzny (3 wear + 0 skill) and Mike St. Peter (3 wear + 0 skill) each bid 3.0, with Kaluzny winning the dice roll for 5th with a roll of only 16. St. Peter rolled an even lower 12 and so started in 6th. Brian Robinson started 7th with a bid of 2.5 (0 wear + 5 skill), and Greg Lim started 8th with a bid of 1.5 (0 wear + 3 skill). Jack Beckman, winner of the 2017 Italian Grand Prix, started in 9th with a bid of only 1.0 (0 wear + 2 skill). Tenth and 11th places were contested by CFR newcomers Bill Worrel and Aric Parr, as each of those two drivers bid nothing. 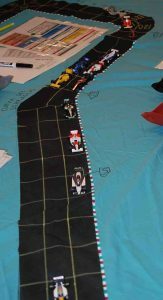 Worrel then won the dice-off by 77 to 03, thus Worrel was 10th and Parr 11th on the starting grid. Although both Worrel and Parr are new to CFR, they both had raced in the old Advanced Speed Circuit series in the Detroit, Michigan, area in the late 1980s/early 1990s. 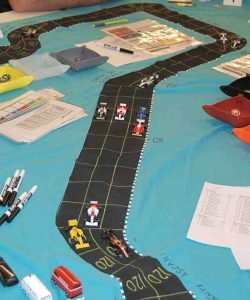 Start = Start Speed (in miles/hour); Accel = Acceleration (in mph); Decel = Deceleration (in mph); Top = Top Speed (in mph); Wear = # of Wear markers; Skill = # of Skill markers; Tires = hard or soft tires to begin the race. Jim Robinson, Mike Cook, Richard White, Mike St. Peter, and Brian Robinson were all racing in the same cars they used in the 2017 CFR-Detroit season. Gary Sturgeon moved from the John Player Lotus to a newer McLaren in black, gold and red livery. Garry Kaluzny’s McLaren now sported Marlboro sponsorship and its dayglo orange and white colors. Greg Lim was also in an orange and white Marlboro McLaren. Jack Beckman stayed with Ferrari, but was now in a model 312 T instead of the former model 312 B2. Bill Worrel raced in a 6-wheeled Tyrrell P34 from 1976, and Aric Parr was in a Motul sponsored BRM P201 from 1974. 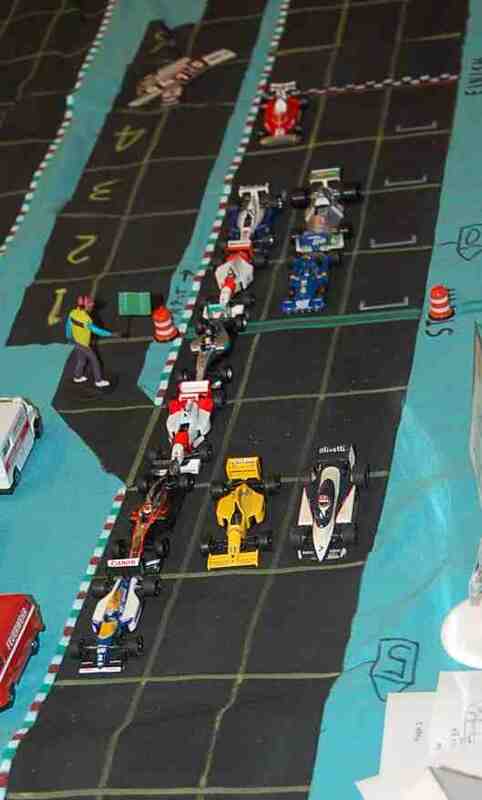 2018 Monza starting grid: 1st row: Gary Sturgeon (black/gold); Jim Robinson (white/blue/yellow). 2nd row: Mike Cook (yellow); Richard White (white/blue). 3rd row: Garry Kaluzny (orange/white); Mike St. Peter (silver/teal). 4th row: Brian Robinson (white/blue); Greg Lim (orange/white). 5th row: Jack Beckman (red/white); Bill Worrel (blue). 6th row: Aric Parr (gray). 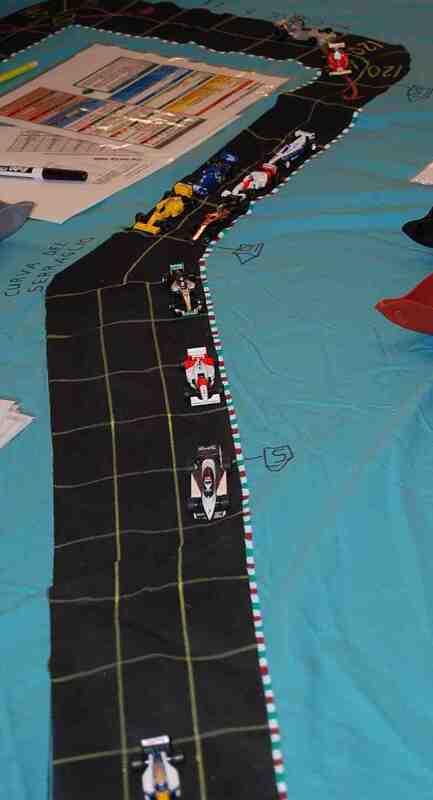 Note that the Monza track has separate start and finish lines. As the field was lined up on the grid, waiting for the green flag to drop, it was noted that most cars had a 60 mph start speed. Two cars, those of Brian Robinson and Jack Beckman, had 20 mph start speeds, but they were starting on the inside of the 4th and 5th rows, and so would not interfere with any faster cars at the start. At the start, Jim Robinson roared into the lead, boosting his start speed to 80 mph by virtue of using a wear as his car was shod with soft tires. Pole-sitter Gary Sturgeon played it safe, moving at his regular start speed of 60 mph. As Sturgeon’s car was on hard tires, he would have had to have rolled dice to try to increase his start speed, and, as most drivers in CFR races can attest, sometimes bad things happen to your car when you roll dice; therefore, sometimes discretion is the better part of valor. Both 2nd-row starters, Mike Cook and Richard White, boosted their start speed to 80 mph and so pulled even with Sturgeon. 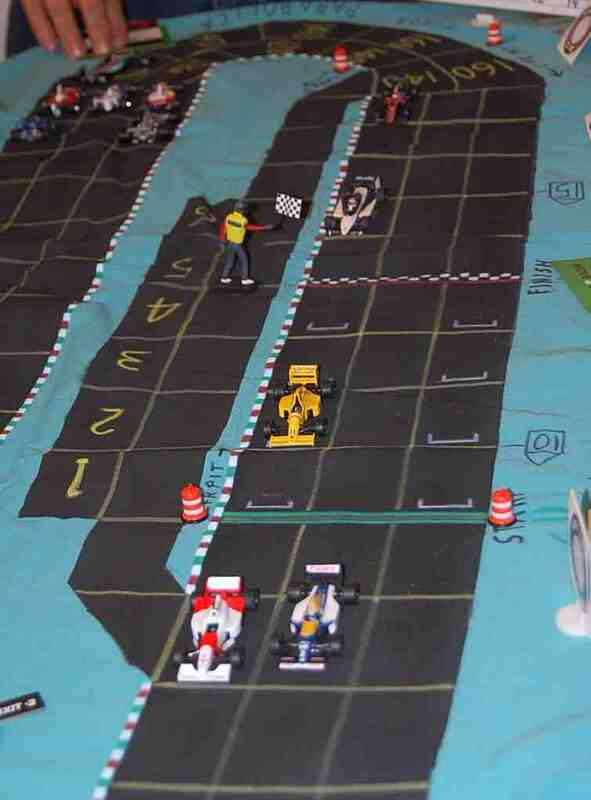 White, on soft tires, spent a wear, but Cook, on hard tires, had to roll dice (and successfully made the dice roll). From the 3rd row on the grid, Garry Kaluzny, on soft tires, spent a wear to start at 80 mph, moving right behind Sturgeon; Mike St. Peter, although also on soft tires, started at only 60 mph and pulled in behind Kaluzny. In the 4th row, Greg Lim started at 60 mph, and Brian Robinson used a wear to start at 40 mph, moving behind Lim. From the 5th row, Bill Worrell rolled dice on the start speed table to increase to 80 mph, and that allowed him to pass B. Robinson and pull alongside Lim. Beckman started at his 20 mph start speed, figuring he would be able to catch up to the pack with his car’s 80 mph acceleration. 11th place starter Aric Parr spent a wear to move 80 mph, thus passing Beckman and pulling up next to B. Robinson. The pack is away! 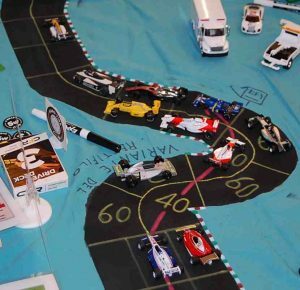 Jim Robinson takes the lead from the green flag at the start of the 2018 Italian Grand Prix. 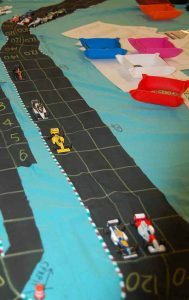 The pack roared down the straightaway, with J. Robinson being the first to enter the first corner, the Variante del Rettifilo. J. Robinson entered the corner at 120 mph, using 3 wears (since he was on soft tires) to pay for being 60 mph over the corner’s speed limit on the racing line. Eight cars were bunched up right behind J. Robinson, with only the cars of B. Robinson and Beckman running behind the pack. White took the inside for 2nd place from Sturgeon, and Kaluzny moved to inside of Cook to take 4th place. Into the 1st corner, J. Robinson leads the pack. Then came White, Sturgeon, Kaluzny, Cook, St. Peter, Worrel, Lim, Parr, B. Robinson, and Beckman. Jim Robinson continued on at 120 mph on the next turn, not needing to pay any more for the corner as he had already paid for exceeding the speed limit on his previous turn. Richard White slowed his car from 120 mph to 100 mph to negotiate the Rettifilo corner, paying 3 wears to move through the 40 mph space. White did not get the benefit of using the racing line (the red arrow), so he was 60 mph over the corner’s speed limit and had to pay 3 “units” for the corner. A “unit” is either a wear or a dice roll, with the limitation in that no driver can use more than one dice (chance) roll in a corner. 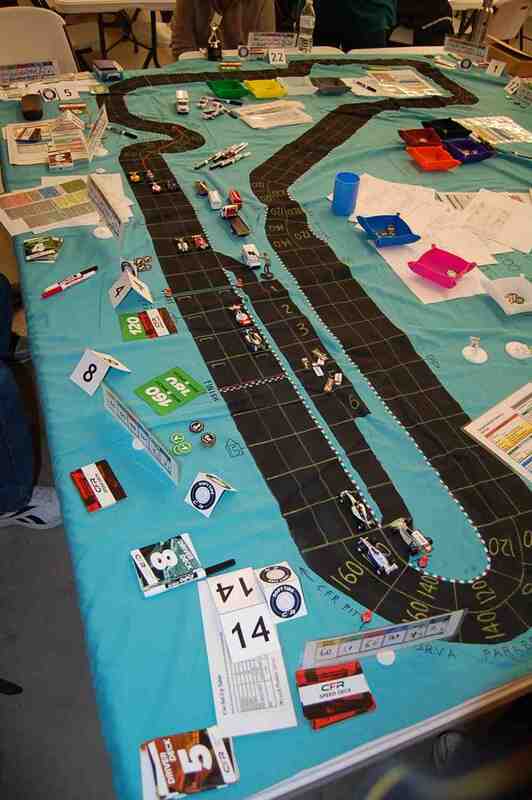 Gary Sturgeon slowed from 120 mph to only 80 mph, using the racing line through the corner, and only had to pay 1 wear. Kaluzny, Cook, and St. Peter were all adjacent to one another going into the Rettifilo corner. Kaluzny plotted a speed of 120 mph, while Cook and St. Peter only plotted 100 mph. Kaluzny thus moved first and used 3 wears (soft tires) to move through the 60 mph spaces all along the outside of the Rettifilo turn. He then took the inside of the track instead of hogging the arrow on the far side of the corner. Kaluzny could not use the cornering arrow, and moved the way he did to keep his speed up to 120 mph, to make it easier to accelerate on the following move. Although Kaluzny moved first, Cook moved at 100 mph and was able to re-pass Kaluzny as Cook was able to use the racing line and only had to spend 2 wears. St. Peter also could not use the racing line, and since he wanted to keep his speed at 100 mph he had to move around the outside of the corner on the 60 mph spaces. Although he could have moved through the 40 mph spaces without benefit of the arrow, he would have to slow to 80 mph as he would have had the cars of Sturgeon and Cook blocking his path. Then it was the turn of the next trio of Worrel, Lim, and Parr to move. Worrel moved first at 100 mph, taking the cornering arrow and spending 2 wears, thus pulling alongside Kaluzny into 6th place (after starting 10th). Both Lim and Parr plotted 80 mph, so Lim moved first (since he was to the inside of Parr), taking the arrow and putting himself in position to accelerate off the corner in his next move. Parr then moved 80 mph, and had to move around the 60 mph spaces on the outside of the corner, thereby being stuck at 80 mph for his next move. B. Robinson was content to move at only 80 mph and ended his move just short of the corner. Beckman moved at 140 mph and took the inside and 10th place from B. Robinson. Through the Variante del Rettifilo for the 1st time. J. Robinson leads from White, Sturgeon, Cook, Kaluzny, Worrel, Lim, St. Peter, Parr, Beckman, and B. Robinson. The pack continued running in much the same order through the Curva Grande, with the exception of B. Robinson passing Parr on the far side of the Rettifilo corner. Then, moving into the Variante della Roggia, Kaluzny was side-by-side with Cook and Sturgeon, but Kaluzny was on the outside. Kaluzny plotted 140 mph to the other drivers only plotting 100 mph. Kaluzny thus moved first, then used late-braking (and 1 wear) to slow to 120 mph for the corner, and then spent 2 wears for the corner. Cook and Sturgeon ended their move just short of the corner, with Cook on the racing line and Sturgeon to the inside. St. Peter then moved up alongside Cook and Sturgeon. Through the Variante della Roggia, J. Robinson still leads from White, Kaluzny, Sturgeon, Cook, St. Peter, Lim, Worrel, B. Robinson, Parr, and Beckman. J. Robinson continued to lead through the two Lesmo corners. As White exited the 2nd Lesmo corner, he attempted to push his top speed to 180 mph, but failed the dice roll with a “12,” in spite of using two -1 skill markers. White’s top speed was thus reduced to 140 mph for the balance of the race. 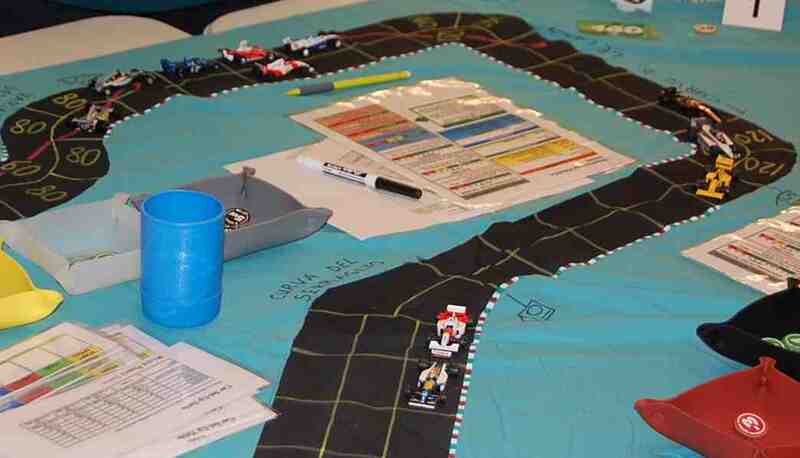 Shortly after, Worrel tried to force-pass the cars of Sturgeon and Cook, but failed with a roll of “9.” Worrel did use two -1 skill markers, but even with the skill modifiers, the “9” became a “7” which was still an unsuccessful pass. Worrel then had to slow from 140 mph to 100 mph. 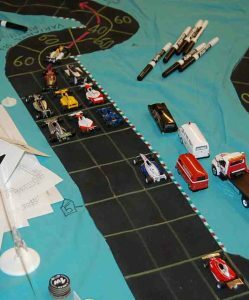 He used a wear and also tried an unmodified deceleration dice roll, but failed that dice roll by rolling a “10.” So Worrel’s deceleration was only 20 mph for the rest of the race. Mike Cook had contested the forced pass, and he had to use a wear due to Worrel’s original forced-pass dice roll. White (top speed) and Worrel (deceleration) have damaged their cars. White’s car is 2nd from the bottom of the picture (the blue and white Brabham), and Worrel’s car is the solid-blue 6-wheeled car behind the yellow Lotus of Cook. As the top three cars (J. Robinson, White, and Kaluzny) came through the final corner of the 1st lap, they pulled into the pits. First pit stops at the end of the 1st lap. J. Robinson, White, and Kaluzny have pitted. The running order for the other cars is St. Peter, Worrel, Cook, Sturgeon, Lim, B. Robinson, Parr, and Beckman. As St. Peter came through Parabolica, he pulled into the pits, Worrel stayed out on the track and became the race leader, with Sturgeon, Cook, and Lim right behind him. Brian Robinson availed himself of the services of his pit crew. Parr spun on the inside lane of the Parabolica, and forced Beckman to take the outside lane to avoid the spun car. Worrel takes the lead while Parr (gray car) has spun in the Parabolica curve. J. Robinson, St. Peter, White, Kaluzny, and B. Robinson are in the pits. When Parr restarted after his spin, he drove his car into the pits. During the pit stops, J. Robinson, Kaluzny, White, St. Peter, B. Robinson, and Parr all switched from soft to hard tires, thus fulfulling their obligation to use both different tire compounds during the race. The drivers who did not pit, Worrel, Sturgeon, Lim, Cook, and Beckman, were all on hard tires and so regained some wear as they crossed the finish line at the end of the 1st lap. The official order after the 1st lap was complete was: Worrel (+9); Sturgeon (-1); Lim (+5); Cook (-1); Beckman (+4); J. Robinson (-4); Kaluzny (-2); White (-4); St. Peter (-3); B. Robinson (-3); and Parr (0). The numbers in parentheses indicate how many places a driver either gained (+) or lost (-) from their starting position. 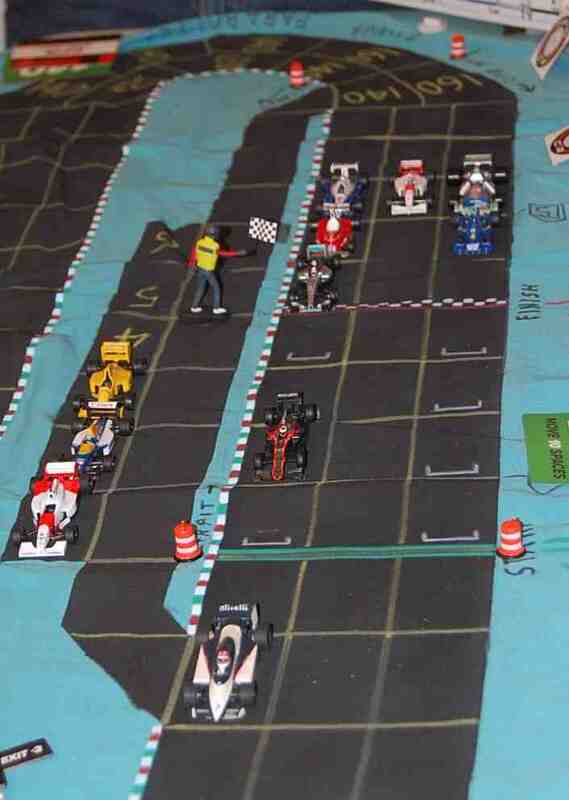 Running order on the track after the 1st lap: Sturgeon leads the race (his car is way up near the S-curve at the top of the picture) with Cook (yellow car) beside Sturgeon. Worrel and Lim and right behind the leaders. Four spaces back are Beckman and J. Robinson, then another four spaces back is Kaluzny, followed by White. Near the bottom of the picture, St. Peter and B. Robinson have just exited the pits and their cars have been placed back on the track. Parr’s car is still in the pits. During the 2nd lap, Sturgeon continued to lead, with Cook and Lim staying right with Sturgeon. Worrel fell back somewhat, as he had to slow sooner than normal for the corners due to his damaged deceleration. 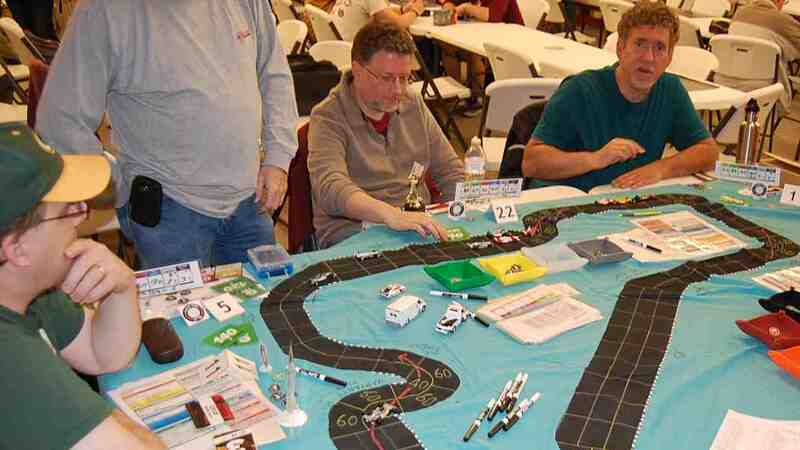 Sturgeon (gray pullover with the 2017 trophy in front of him) and White (green shirt with an alarmed look) observe the race as Sturgeon leads into the 1st Lesmo curve. Mike Cook (green and yellow hat) is also looking on. Standing is Brian Robinson. As the trio of leaders, Sturgeon, Cook, and Lim went through the Variante Ascari chicane, they had a 5 space lead over the four cars of Beckman, Worrel, Kaluzny, and J. Robinson. White was then another 4 spaces back, and 6 spaces behind White were St. Peter and B. Robinson. Parr was running 11 spaces behind St. Peter and B. Robinson. Sturgeon, Cook, and Lim lead through the Variante Ascari. As the leading cars of Sturgeon, Cook, and Lim came through the Parabolica, they had to pull into the pits to swap their hard tires for soft. The leaders (Sturgeon, Cook, and Lim) have pitted. The running order on the track is: J. Robinson, Kaluzny, Beckman, Worrel, White, St. Peter, B. Robinson, and Parr. Also pitting at the end of the 2nd lap were the cars of Beckman and Worrel, and St. Peter made a 2nd stop to switch back to soft tires for the final lap. All of the other pittees switched from hard to soft tires. The cars that eschewed pitting, those of J. Robinson, Kaluzny, White, B. Robinson, and Parr, were all on hard tires, and so each car picked up some wear as they crossed the finish line to begin the race’s final lap. Jim Robinson and Kaluzny have the lead by 7 spaces over the rest of the field, with one lap left to race. The official order at the end of the 2nd lap was: Sturgeon (0); Cook (+1); J. Robinson (-1); Kaluzny (+1); Beckman (+4); White (-2); St. Peter (-1); Lim (0); B. Robinson (-2); Worrel (0); and Parr (0). 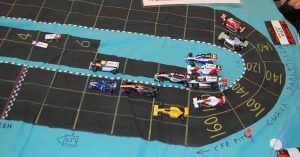 But due to pit stops, the running order on the track after the pits stops were resolved was: J. Robinson; Kaluzny; White; Sturgeon; Cook; B. Robinson; Lim; Beckman; Worrel; Parr; and St. Peter. The final lap turned into a two-car race between Jim Robinson and Kaluzny. J. Robinson had a 2-space lead most of the way around the track. White, although his car had only a 140 mph top speed, was trying to stay ahead of Sturgeon and Cook. Then when Sturgeon was about to go into the 1st Lesmo corner, he failed an unmodified top speed roll, moving only 160 mph instead of 180 mph, and lowering his car’s top speed to 140 mph for the rest of the race. But Cook was able to pass White between the two Lesmo corners, thus taking over 3rd place. Kaluzny is directly behind Jim Robinson. Cook, White, and Sturgeon are 3rd, 4th, and 5th. Having a dogfight for 6th place are B. Robinson, Lim, Beckman, Worrel, St. Peter, and Parr. As the leaders approached the Variante Ascari chicane for the final time, Kaluzny pulled alongside Jim Robinson, although Robinson still had the inside lane to that corner. Robinson went 140 mph through the 120 mph spaces of that corner, using his last wear. Kaluzny went only 120 mph through the 120 mph space, saving his last wear for the final corner of the race. Jim Robinson then went 160 mph down the back straightaway, while Kaluzny went 160 mph but used the slipstream to pull alongside Robinson just before the Parabolica corner. Kaluzny has pulled alongside Jim Robinson just before the final corner, the Parabolica. A the Parabolica, Kaluzny was able to move faster than Jim Robinson, 140 mph to 120 mph because Kaluzny had a single wear remaining to J. Robinson being out of wear, so Kaluzny moved first and also moved one extra space, so he was then one space in front of J. Robinson. 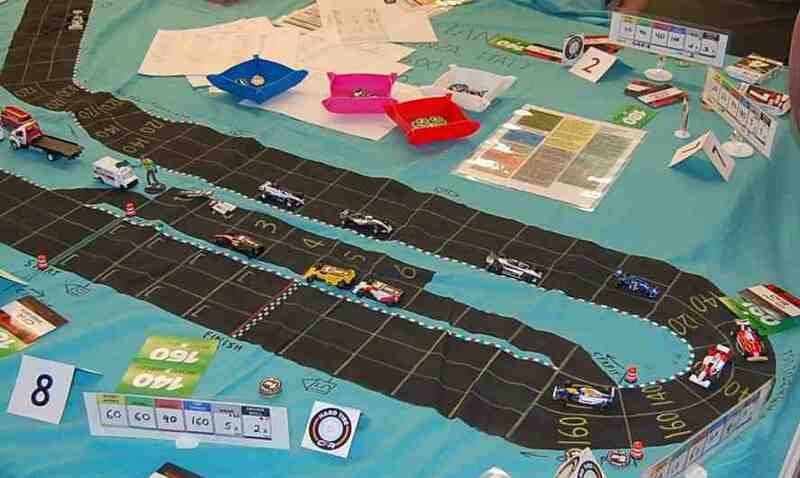 At this stage in the race, neither racer felt the need to roll dice and take a chance, as a sure 2nd place is better than possibly crashing and then getting no points at all! Kaluzny then moved only 160 mph, while J. Robinson pushed his accleration to 60 mph to get to his top speed of 180 mph. That allowed J. Robinson to pull alongside Kaluzny, but Kaluzny was able to take the checkered flag in 1st place as he was to the inside of the track due to his having moved before J. Robinson. Robinson had hoped that Kaluzny would have also pushed his top speed to 180 mph, which would have allowed Mr. Robinson to “slingshot” past Kaluzny with a 2-space slipstream bonus (and that 2-space slingshot would have given Robinson the victory). As Cook came out of Parabolica, he attempted to also drive at 180 mph, but failed his top speed dice roll. But he still easily finished 3rd over White, who easily finished 4th over Sturgeon (who was 5th). Kaluzny nips Jim Robinson to take the checkered flag and the victory. Then came the dogfight roaring around the Parabolica. 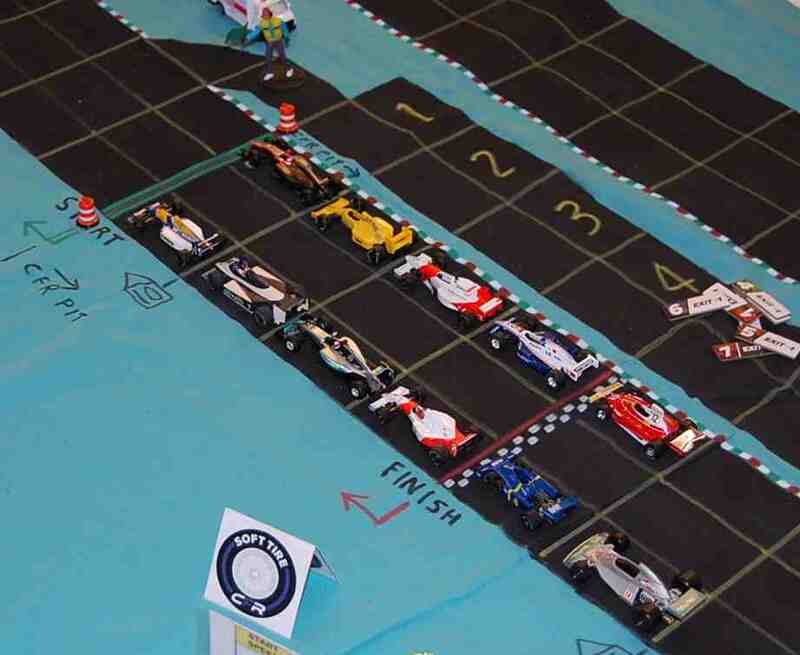 Six cars were fighting to see which one of them would take the single point for 6th place. Mike St. Peter out-dragged the competition down the back straight, going into the outside lane of the Parabolica at 180 mph. He had to make two unmodified dice rolls (for acceleration and top speed) to get to 180 mph. But once into that corner at that speed, he could continue at 180 mph the next turn, and that allowed his car to touch the finish line before any of his competitors. Brian Robinson only went 160 mph, but used a -3 skill marker to make his chance roll around the outside of the corner. Jack Beckman made an unmodified top speed roll to go 180 mph, then used a wear and a -1 chance roll to make it through the corner. Bill Worrel pushed his car to 200 mph around the outside of Parabolica, making an unmodified top speed roll and using his last 3 wears get through that corner. Mike St. Peter (silver car nearest the checkered flag man) takes 6th place in a wild battle for the final points-paying position. The pack of cars still contended fiercely for 7th place. Worrel pushed his car to 200 mph again, while Parr went 180 mph and got two slipstream spaces from Worrel, so Worrel was 7th, Parr 8th, Lim 9th, Beckman 10th, and J. Robinson 11th. The final finishing order was: Kaluzny (+4); J. Robinson (0); Cook (0); White (0); Sturgeon (-4); St. Peter (0); Worrel (+3); Parr (+3); Lim (-1); Beckman (-1); and B. Robinson (-4). Points awarded at the 2018 Italian Grand Prix: Kaluzny 10; J. Robinson 6; Cook 4; White 3; Sturgeon 2; St. Peter 1. 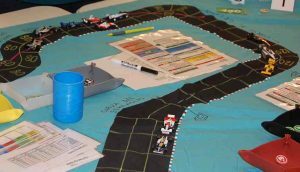 The next race of the 2018 CFR-Detroit racing campaign will be on Friday, June 8, at RIW Hobbies & Games in Livonia, Michigan. The British Grand Prix will be contested on the modern Silverstone track. Bidding for qualifying begins at 6:45 pm sharp, so drivers are asked to try to arrive by 6:15 pm to set up their car’s specifications for the race.